General Magic was a dream of a company founded in 1990 by Bill Atkinson and Andy Hertzfeld (who had previously combined to create most of the original Mac's look and feel) along with Marc Porat. General Magic was founded to build handheld wireless communication devices, but the hardware and networking technology wasn't quite there yet, and the advent of the Internet undercut and overwhelmed the company's intentions. I started working at General Magic in 1990, and it was a blast. 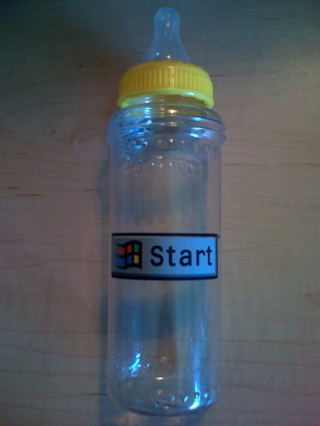 I could tell a bunch of stories about the company, but for today I just want to post the artifact below. 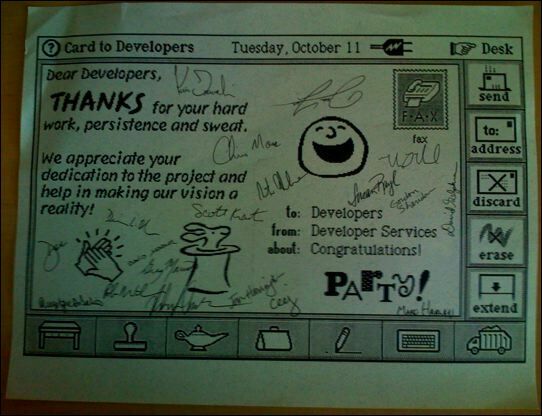 It's a faux "telecard", just as it might appear in the Magic Cap user interface, that we sent to our ISVs when the first Sony Magic Link device shipped, signed by the General Magic folks who worked with developers. 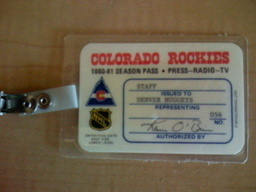 The Colorado Rockies were a National Hockey League team, mostly forgotten now. The Rockies played in Denver for 6 seasons in the late 1970s and early '80s. Their wacky logo was a mountain carved out of the Colorado state flag. They were spectacularly unsuccessful on the ice, making the playoffs only once in those 6 seasons. The Rockies are known for having employed Don Cherry as head coach, and for being the first sports team to use "Gary Glitter's Rock & Roll, Pt. 2" regularly at games. Eventually, Cherry left the team, the team left town, and a perennially crappy baseball team stole the name.